After Liam Neeson said a horse from a previous movie remembered him on the set of The Ballad of Buster Scruggs, Russell Crowe confirmed that the same thing happened to him. 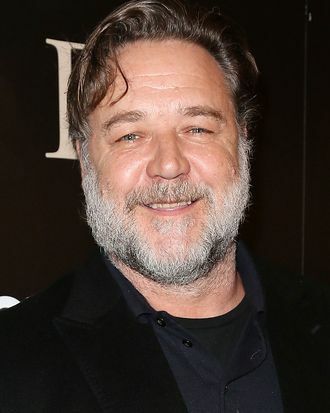 A horse from Gladiator, Crowe said on Twitter, recognized him on the set of Robin Hood. When Crowe walked the red carpet for Boy Erased on Monday night, Vulture asked about all of this horsing around. “I don’t know if you’re a fan of my movies or if you’ve ever seen my movies — I do tend to ride a horse every now and then. And people are very complimentary about my horse riding, which is very lovely. But it’s taken me 40-plus years to perfect that as a skill. At the end of the day, it’s just about hours,” he began. Crowe said that he’s ridden horses in movies since the early ’90s, and the community of horses and handlers is relatively small. When he was on set for Robin Hood, a horseman he’d worked with before told the actor that he’d be reunited with his Gladiator co-star, a horse named George. “So I went and said hello to George. I went up to George, and I put my hand on his face — I actually put my hand under his nostrils first and touched his mouth, that’s what I always do, that’s how they recognize that it’s me. Then I brought his face to me, and I whispered to him: ‘Hey, mate, you know we won the Academy Award together,’” Crowe recalled. George, he said, gave him a little whinny of acknowledgement. “A lot of people ask, ‘If you fall in love with these horses, why don’t you take them home?’ They fail to understand that these working horses, they have a certain energy of their own. They know they’re in show business,” Crowe explained. “They should just be left to do their job. It’s very interesting. A good movie horse is such a valuable thing because it knows what to do on a set. So that’s why it reoccurs; it’s not every horse that can be a great movie horse.” Well, giddy up! What’s With All the Dead Horses?